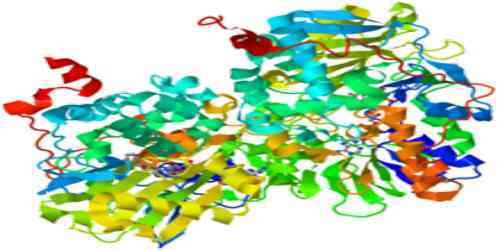 Monoamine oxidase is an enzyme in the cells of most tissues that catalyzes the oxidative deamination of monoamines such as serotonin. 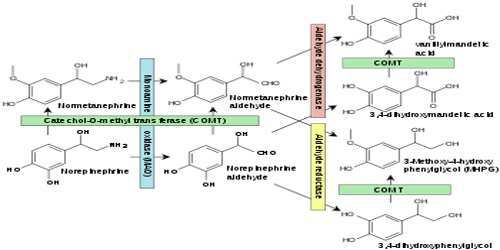 It is a family of enzymes involved in the metabolism of monoamines. Their role in the breaking down of monoamines has caused monoamine oxidase enzymes to be targeted in the treatment of disorders that are thought to involve low monoamine levels (e.g. depression). 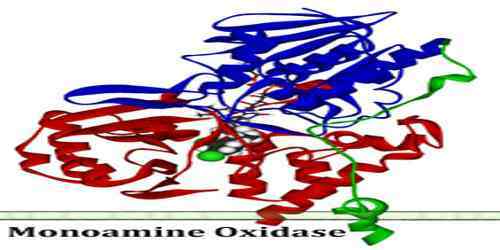 The enzyme was originally discovered by Mary Bernheim in the liver and was named tyramine oxidase. They belong to the protein family of flavin-containing amine oxidoreductases. It therefore plays a key role in the regulation of nerve transmission, and alterations in its activity produced by pharmacological intervention or through genetic variants are likely to have profound effects on behavior. Indeed, drugs inhibiting its activity have long been employed in the treatment of behavioral disorders, particularly depression. Members of the monoamine oxidase family of flavoproteins catalyze the oxidation of primary and secondary amines, polyamines, amino acids, and methylated lysine side chains in proteins. The enzymes have similar overall structures, with conserved FAD-binding domains and varied substrate-binding sites. Multiple mechanisms have been proposed for the catalytic reactions of these enzymes. Monoamine Oxidase (MAO)-A appears at roughly 80% of adulthood levels at birth, increasing very slightly after the first 4 years of life, while MAO-B is almost non-detectable in the infant brain. Regional distribution of the monoamine oxidases is characterized by extremely high levels of both MAOs in the hypothalamus and hippocampal uncus, as well as a large amount of MAO-B with very little MAO-A in the striatum and globus pallidus. The cortex has relatively high levels of only MAO-A, with the exception of areas of the cingulate cortex, which contains a balance of both. Autopsied brains demonstrated the predicted increased concentration of MAO-A in regions dense in serotonergic neurotransmission, however MAO-B only correlated with norepinephrine. Monoamine oxidases A and B (MAO A and MAO B) are outer mitochondrial membrane proteins that catalyze the oxidation of primary, secondary, and tertiary amines, including several neurotransmitters, to the corresponding imines; the oxidized products are hydrolyzed nonenzymatically to the respective aldehydes or ketones. Oxygen is used to remove an amine group (plus the adjacent hydrogen atom) from a molecule, resulting in the corresponding ketone (or aldehyde) and ammonia. The two enzymes share 70% amino acid identity, and both contain a covalently-bound FAD cofactor attached to an enzyme cysteine via the 8α-methylene of the isoalloxazine ring. 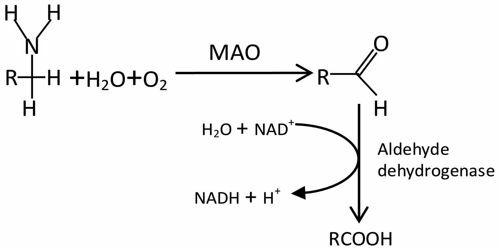 MAO A metabolizes serotonin (5-hydroxytryptamine), norepinephrine, and dopamine, while MAO B preferentially oxidizes benzylamine, dopamine and phenylethylamine and only metabolizes norepinephrine and serotonin slowly. MAO B also forms the neurotoxin 1-methyl-4-phenyl-pyridinium, a causative agent of Parkinson’s disease, from 1-methyl-4-phenyl-1,2,3,6-tetrahydropyridine (MPTP). Inhibitors of the monoamine oxidases have been used clinically for the treatment of depression, as well as Parkinson’s, Alzheimer’s and other neurodegenerative diseases. Four main models have been proposed for the mechanism of electron transfers (single electron transfer, hydrogen atom transfer, nucleophilic model, and hydride transfer) although there is insufficient evidence to support any of them.